The first RAF Tornado was delivered to RAF Cottesmore on 1st July 1980. In June 1982, No. IX (B) Squadron became the first front-line squadron in the world to operate the Tornado and the Squadron has operated the Tornado ever since. No. 31 Squadron took delivery of the Panavia Tornado in 1984. 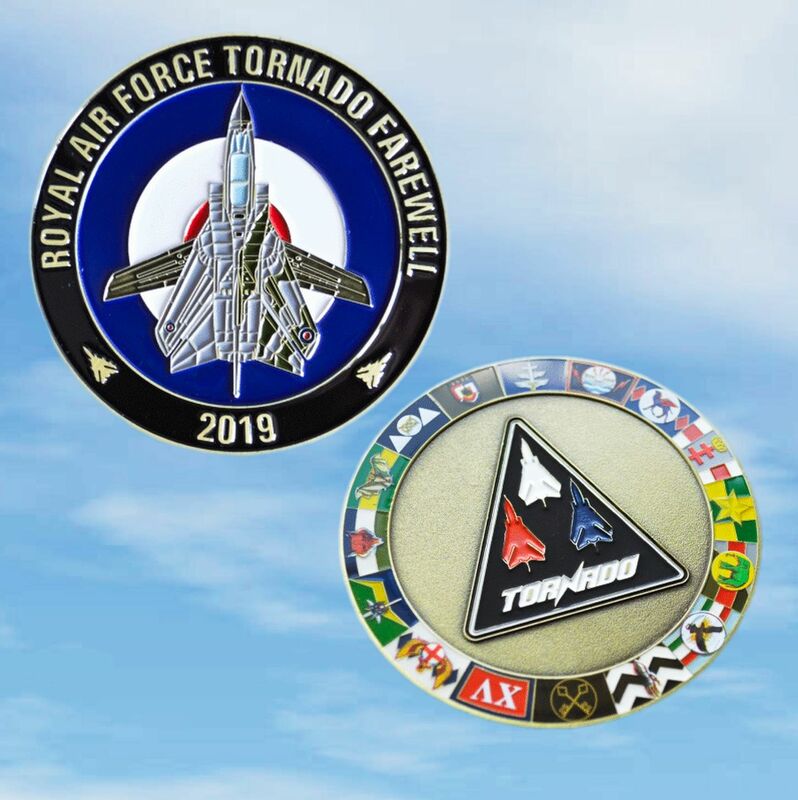 On 5th February 2019 RAF Tornado jets returned home to the UK for the last time as the aircraft prepares for retirement after almost 40 years in service. No. IX (B) Squadron and No. 31 Squadron are the last two units to fly the "Tonka". 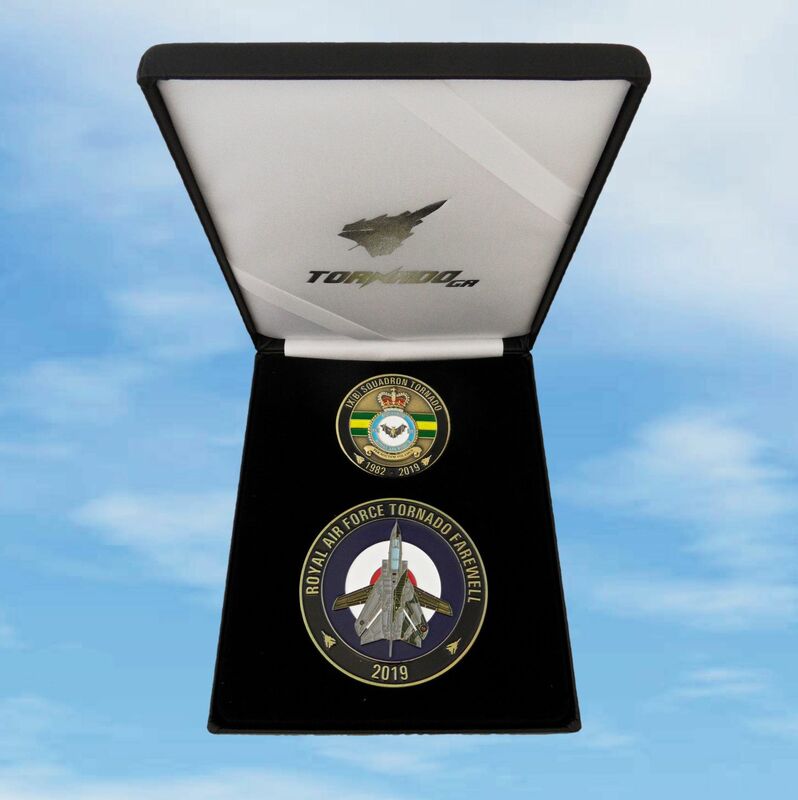 Taking centre stage in this commemorative coin set is a stunning 2.5″ diameter coin that is 5mm thick and weighs over 90 grams! On one side, each squadron/unit that has operated the Tornado GR in Royal Air Force service is represented around the edge in minute detail. 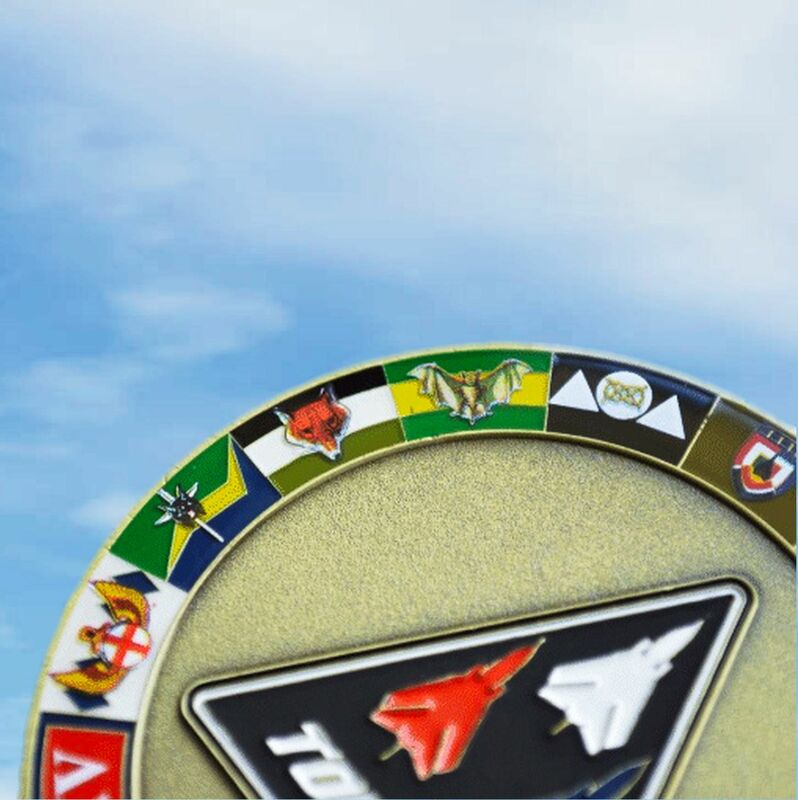 The Tornado triangle patch is depicted in the centre of the coin using matt black enamel to ‘pop’ out the colours. The reverse has the Tornado planform with both paint schemes applied during its service, camouflage and RAF grey. A smaller, 1.75″ diameter coin sits above the 2.5″ coin in the box. 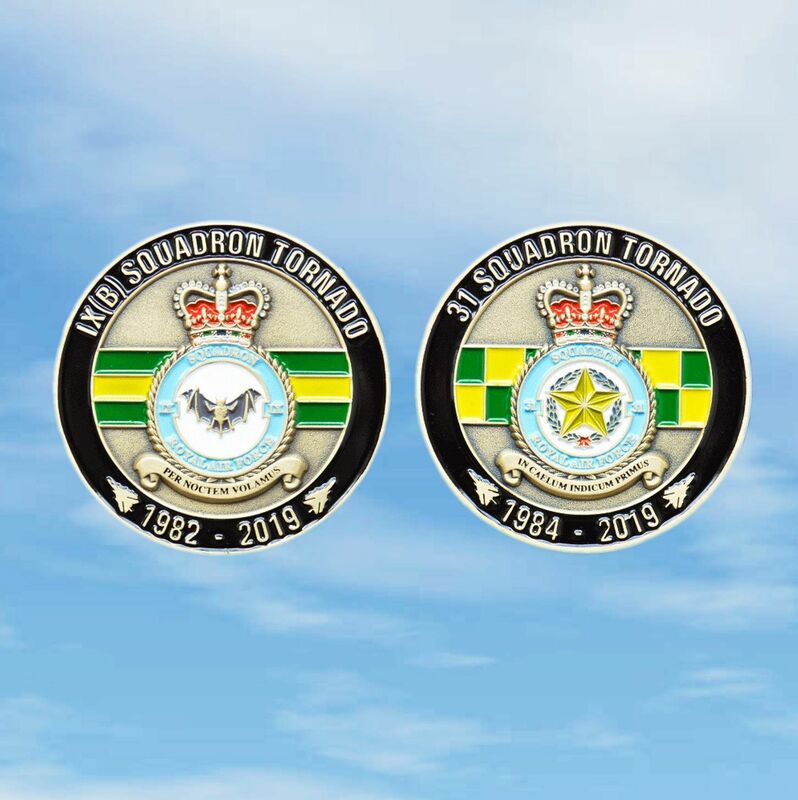 This coin features the crest of each of the two final RAF Tornado squadrons, No. IX (B) Squadron and No. 31 Squadron. A bat - approved by King Edward VIII in November 1936 as an authorised version of a badge highlighting the Squadron's night-bombing duties. In front of a wreath of laurel, a mullet - approved by King George VI in June 1937. The badge was based on an unofficial emblem, the mullet indicating the Star of India and the Squadron's claim to being the first military unit to fly in India. 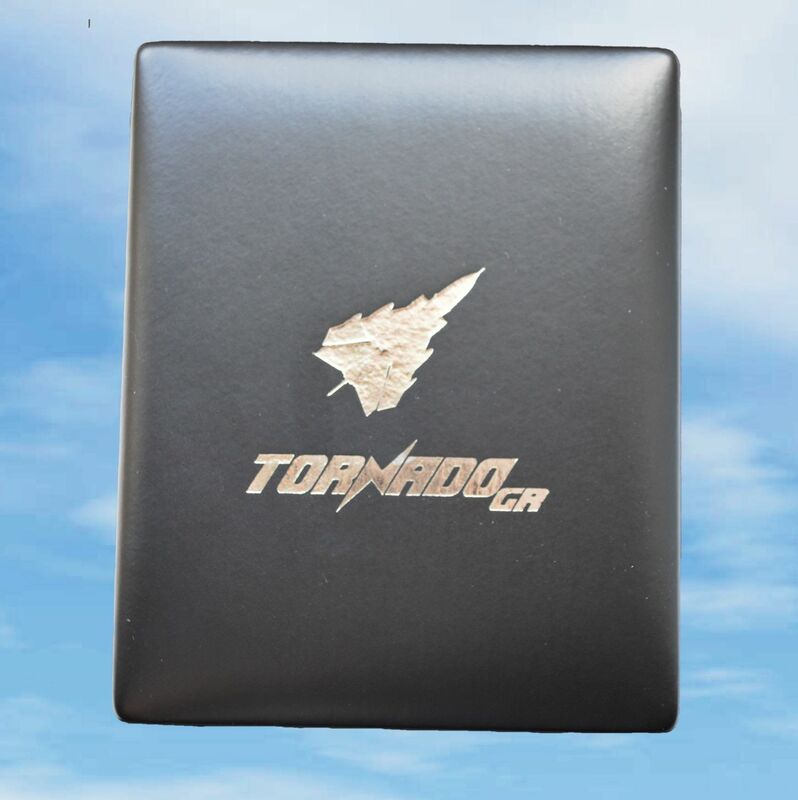 The coins come in a beautiful black presentation box with a printed lid inside and out complete with a Tornado GR Aircraft Specifications card.